During a long-term emergency, you’re going to be burning plenty of calories during the day as you keep yourself, your family, and your property safe. Get a jump-start on the day with our 120-serving breakfast bucket. 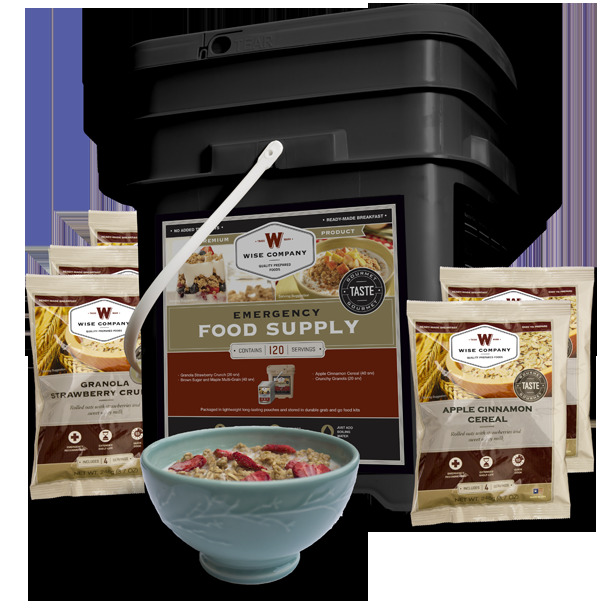 Each bucket contains a selection of tasty, nutritious cereals and granola to fire up your metabolism and get you moving. Mom always said breakfast was the most important meal of the day, and that holds true even when you’re dealing with the uncertainty of an emergency situation. 120 Servings Breakfast Assortment. No Mains. 120 Serving Breakfast Only Grab and Go Bucket. This Grab N Go container includes 30 four serving mylar pouches with a variety of different Breakfasts. This allows you to open one pouch at a time without decreasing the shelf life of all the other pouches left in the bucket.